Find our printable Roman Numerals chart selection on this page: Roman Numeral clock faces, charts, copywork, and flash cards. Sometimes your students need a Roman Numerals chart to remember what number goes with which letter. Once they know the adding and subtracting tricks, all they need is the chart to reference. 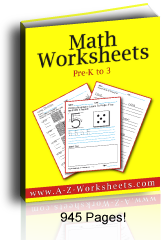 Our printable Math worksheets on this page include a chart, a clock face, and flash cards. 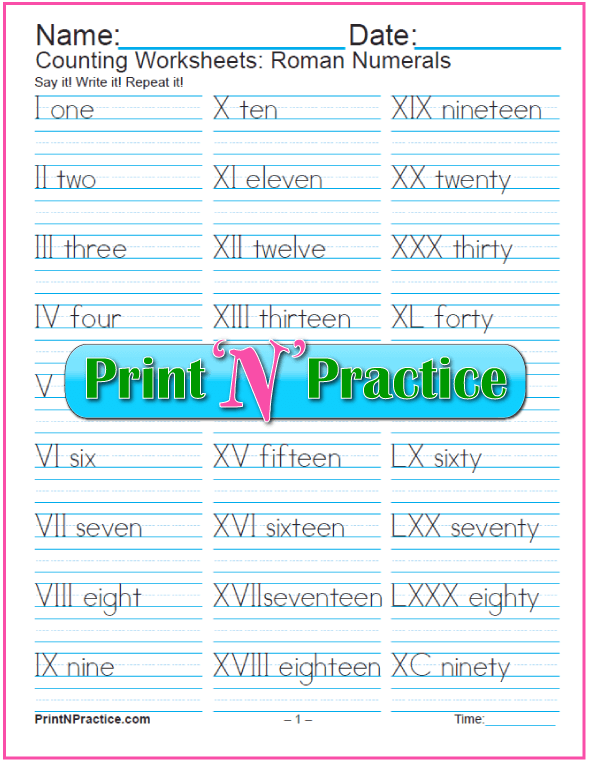 This is an awesome page for teaching Roman numeration or for reviewing. There are many places that these numerals are used especially on buildings, fancy analog clocks, in Bible quotes and in scientific terms. "Hey! Those are on the Olympics and the Super Bowl!" Be sure to see the note about the IIII on Roman numeral clock faces below. How many numerals can you list? Did you know that there are only seven? You'll also find a bit of the history of Roman numerals on this page. Worksheets constructing dates are at the bottom of this page. Numeral Clock Face Worksheet, IV or IIII? When I start to teach Roman numerals to children who haven't previously learned them, they marvel at how often they find them in their everyday lives. "My mom uses remedies that have that on them." When we're studying larger numbers using dates they'll say, "I saw that on the brick building in town!" or "That's on our DVD cases! I always wondered what that was." It is great fun to teach Roman numerals, especially when you draw a clock and explain the first twelve numerals and how to add and subtract the values. It's always more fun when it seems like we're learning a new code or puzzle! My favorite quote from a student was, "I tried to read those like words and it did not work!" Too cute. Once your students are familiar enough with addition and subtraction they can learn how to write Roman numerals quickly. If they can add and subtract up to 1000, they can learn all of the numerals in just a few lessons. It's like reading in code. 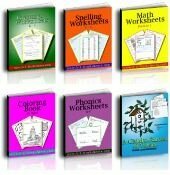 Several Math textbook series that I have used simply repeat the very same Roman numeral lessons year after year. Why? There's very little to learn mathematically speaking. Literature, History and English Grammar lessons can cover many uses of Roman numerals as with outlines, chapters and volume numbers. These are great to learn for Bible study, too. Older or handier students can learn the whole list at a glance since there are only seven numerals in the list. The first thing to know about how to read Roman numerals is that they aren't numerals! They're Roman letters that stand for different values. The Roman numeral for 1 is the capital letter I. 10 is an X. 100 is a C. 1000 is simply M. Lower case letters are also used, especially in outlines and on some clocks. 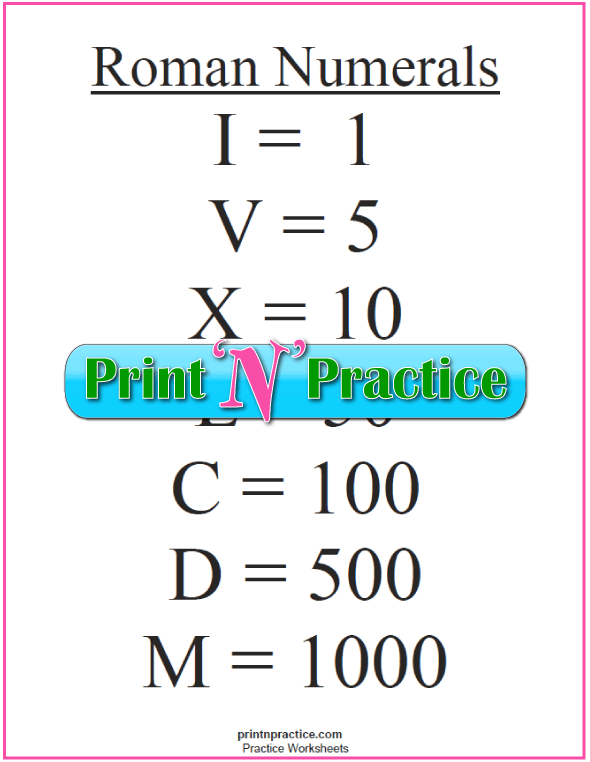 Roman numeral conversion is easy once you understand the method and even the equation that denotes each number. I love teaching these with the equations. It's when I hear the most oohs and ahs! "I get it! ", "Hey, this is neat! ", and "Can we do more of these?" And similarly through the rest of the numbers. 3. 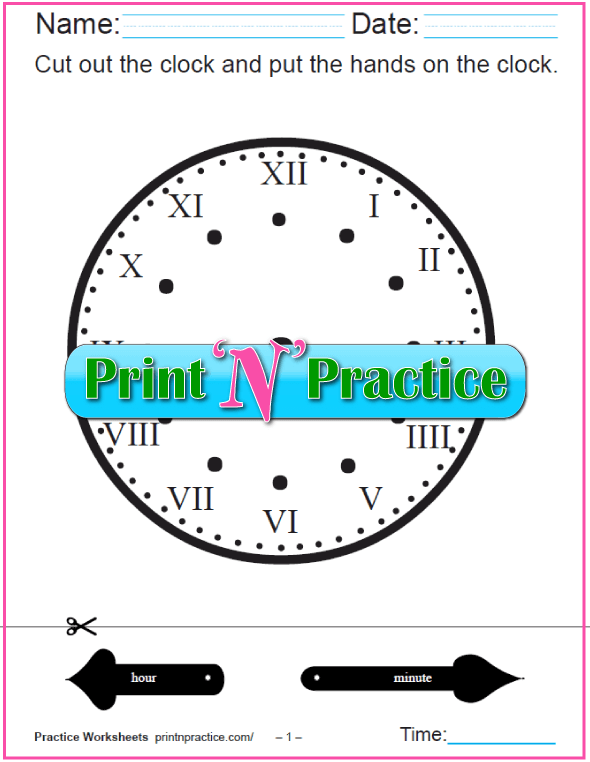 Printable Roman Numeral Clock Face: IV or IIII? Use the Roman numerals chart in section one and the conversions in section two to teach how to make Roman numerals on a clock. IIII Or IV Roman Numerals On Clocks? Wikipedia has a great description of the Roman numeral clock face at the end of its article. Reasons of symmetry and the neatest explanation of molding the letters so as to only have four molds to make all twelve numerals. Who would have thought that Roman numerals on clocks use IIII instead of IV? These are thoughts that I had not known and thought that you would like to know them, too. They make teaching Roman numerals fun. I'd never paid attention to the IIII before reading the article at Wikipedia's Roman Numeral Clock Face article. Wikipedia also has an excellent history of Roman numerals from them actually having derived from ordinal tally marks to becoming the numerals we use today. Use this Roman numerals chart for easy reference. Print it on card stock to use as a Math poster. I also have a chart that your students can use to copy the seven numerals - see more worksheets below. Using a chart is only necessary until you know the values of the seven numerals and can translate them using addition and subtraction. Memorization is key, although it is no big deal to look it up. "The multiples of 5 are 5, 10, 15, 20, .... The numbers that are one less than these (4, 9, 14, 19, ....) have Roman numerals that involve subtraction. In each case where a smaller Roman numeral (I) precedes a larger Roman numeral (V or X), we subtract the smaller number from the larger number." --Saxon Math 65, p. 630 Homeschool Edition. 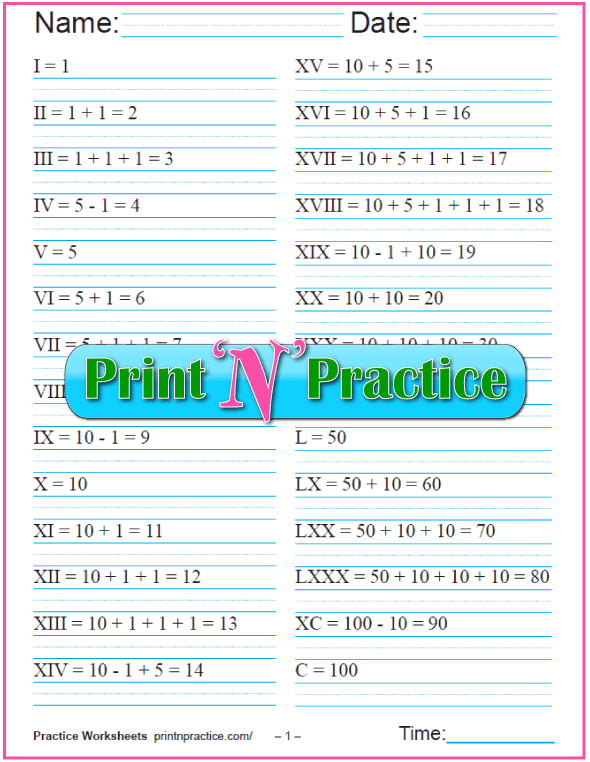 I like to let my students use the Roman numerals chart above as they copy the equations for these worksheets. It helps them make or keep the association between the Arabic number and the Roman. 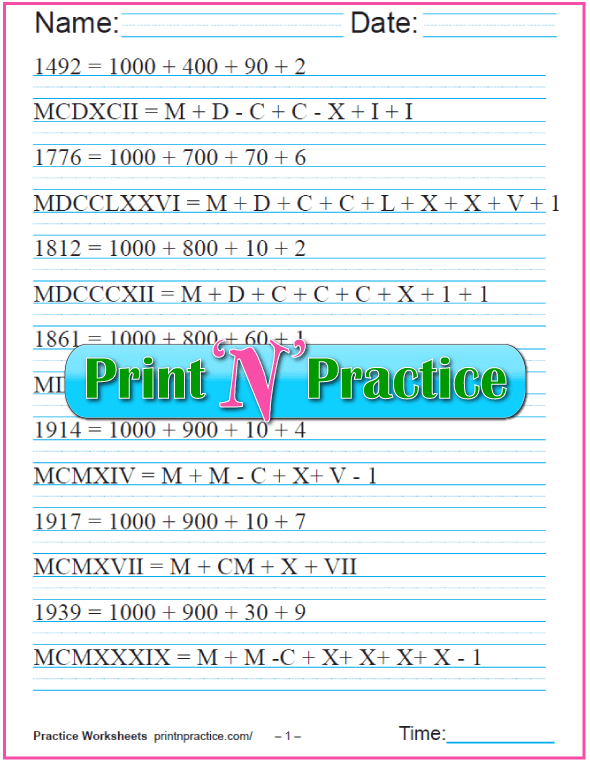 Printable Roman Numeral Worksheet with equations. Roman numeral conversion can be easy once you've been taught how to translate the numbers. These worksheets also include a table of frequently memorized dates. Generally, there's not much need for teaching Roman numerals beyond the first 1-100 except for forming dates. I've seen sixth grade Math books that did not offer much more than a Roman Numerals chart. There was very little practice building the higher numbers which is probably the reason so many people fumble converting Roman numeral dates. Converting dates is where the children get to use the last four numerals more often. What's fun is that kids often find that the equations are fun to learn and decipher. 2. 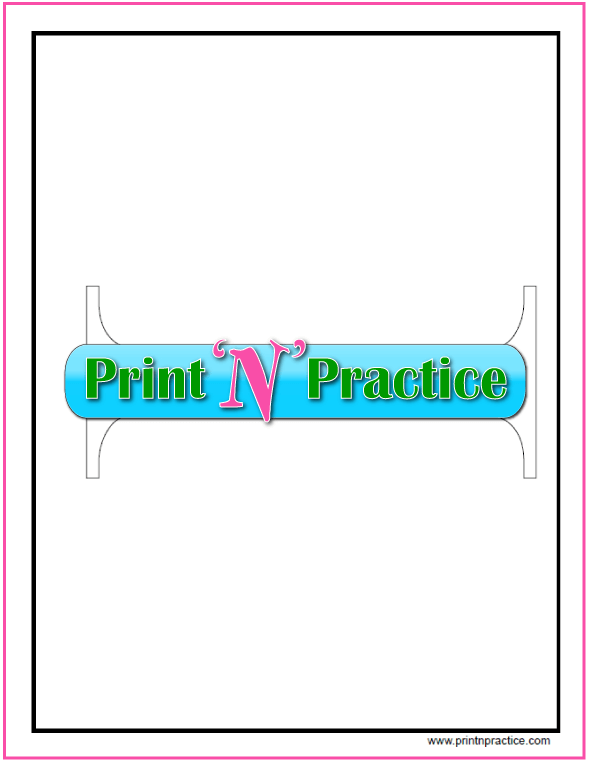 Use our worksheets for practice making the larger numbers in the hundreds and thousands. 3. Then use expanded notation to show how to build the number in Arabic numerals with an expanded notation for building the Roman numerals. Your students can then review this for homework with our Roman Numerals Table For Popular Dates. Being shown how to make the larger numbers is fun. So many Math lessons show how to make a few, but they often do not show the numerals in order or show enough to practice. End of difficulty! Once you know the Roman numeral conversion you can make the conversion the rest of your life with a reminder from a Roman Numerals chart for the different values. 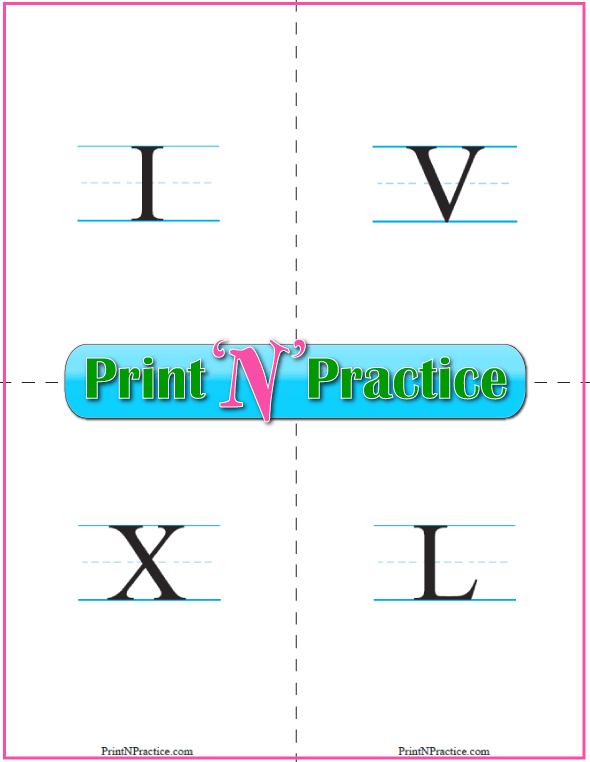 Print our Roman Numerals Flash Cards on card stock two sided or single sided which ever you need. The answer side has the numeral and the value with the spelling of the number as with the Roman Numeral for 100 having C = 100 = one hundred. 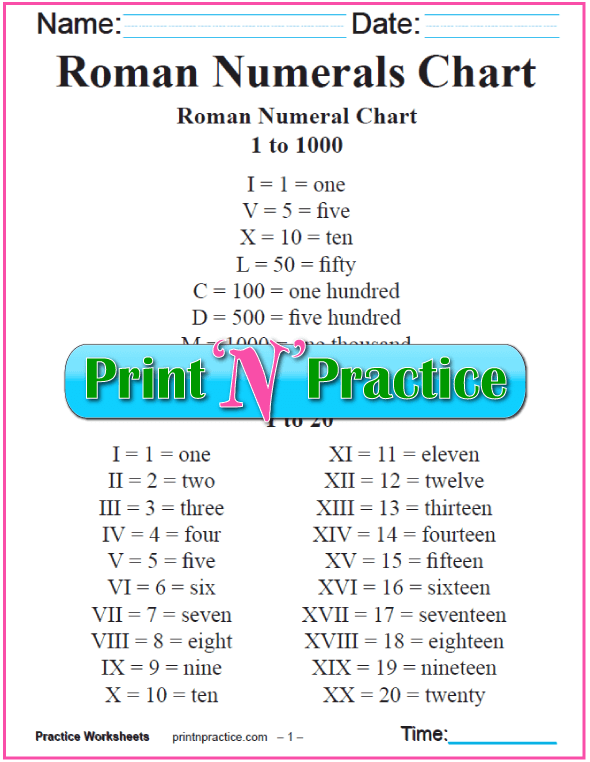 Thank you for visiting our Roman Numerals chart and Roman numerals worksheets page. Want more? Are you also teaching about Prime Numbers?